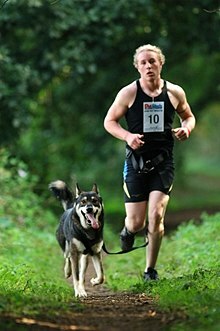 Canicross - Running with your dog! Canicross involves running off-road with your dog, tethered together, and is among the fastest-growing sports in the USA and the UK. The events range from fun runs to local, regional, national and world championships. Runners wear a belt around their hip and lower back, and have a tether which is attached to a body harness on the dog. In the top-level events, the human runners are pulled along by their dogs, achieving times that they couldn't do on their own! At lower-level events, the dogs are usually a bit less focused, and tend to get distracted along the route - obviously there's more to canicross than just running with your dog! 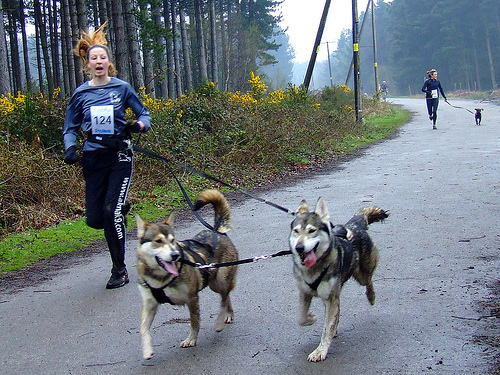 Canicross racer and coach Jenny Lee (www.joggydoggy.co.uk) says that "running is in a dog's DNA - dogs evolved to hunt, and need to run". And research at the University of Arizona has found that dogs experience a "runner's high" just like humans. As Jenny Lee says, it's about developing your dog's focus and skills, and learning how to work as a team. In her classes, dogs are trained to run through a short route filled with distractions such as toys, balls and pushchairs. Also, dogs and their owners are taught how to pass other teams - and how to allow another team to pass, how to change pace, and how to change direction. Dogs can learn "left" and "right" quite quickly. Jenny started running with her labrador about 7 years ago, and then took up events with her 2 kelpies. "You'll run faster than you've ever run before" she says, "which means you'll need to concentrate on your running form as well as building a strong core to maintain good posture while being pulled along". And of course, running is extremely beneficial for your dog, too. The benefits include improved musculoskeletal and cardiovascular fitness, as well as stimulating their brain and improving behaviour. Dogs are generally ready to run at the drop of a hat, but like humans, they need to train over a period of time to build up endurance for longer events. While running on roads is fine for short distances, it's better to get onto off-road trails and tracks as soon as possible, to avoid stress on the animal's joints and paw pads. The general rules that apply to humans - only increase long run distance by 10% a week, and plan complete rest days too - also apply to dogs. 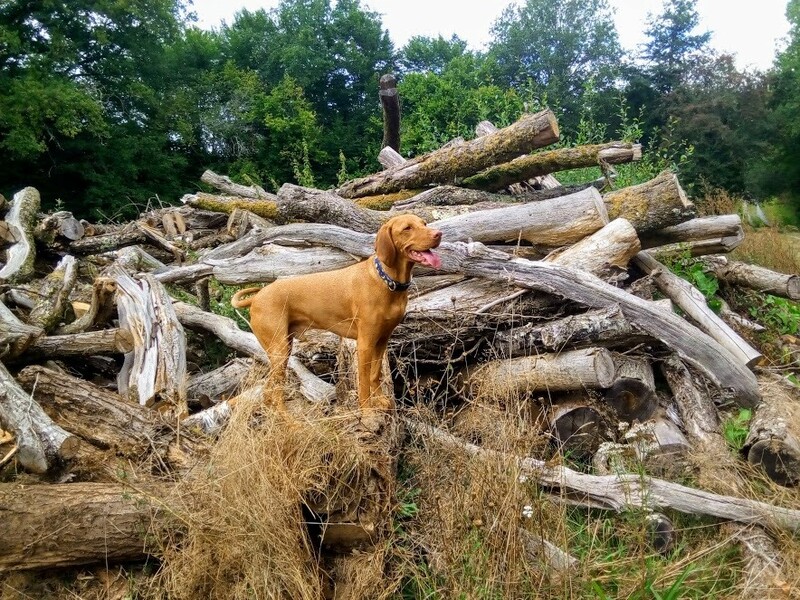 One problem is that your dog will always want to be with you, so will not make it obvious that they are a bit tired and could really do with a day or two off training. You have to observe them carefully around the house to see if they are getting over-tired. As most dog owners know, having a dog is good for us; dog owners are 34% MORE likely to achieve the minimum recommended physical activity guidelines. Also, dog owners tend to have lower blood pressure and lower blood cholesterol, and suffer fewer medical conditions and problems than non-dog owners. After some training, you're ready to enter your first event! To start off, you should not aim too high. Look for a small, local event that is more of a "fun run". 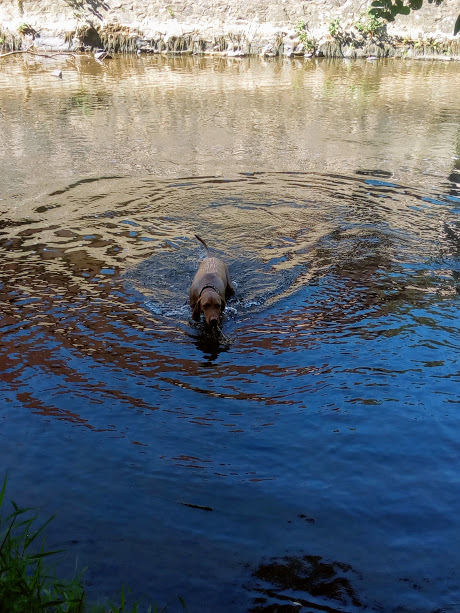 Some events will let you run with just the dog's normal collar and lead, so that you don't have to spend money on proper canicross gear until you're sure you like it. However, a collar can restrict your dog's breathing, and after trying the sport out, you should think bout buying a proper dog harness to allow better limb movement. The next thing to get is a tether with a section of bungee cord, which helps to soften the jolt of abrupt stops and changes of direction from your canine friend! The next step is to get a waist belt for your self, to attach the tether to. It actually sits around your hips, and some even have leg loops for additional support. At the start of a race, you will probably be sent off at intervals, although there are some events that operate a mass start. Remember to pace yourself evenly at the start, and don't get carried away by chasing the faster runners. Offer encouragement for your dog, carry some treats, and some water. Make it fun! And NEVER drag your dog or force him run. 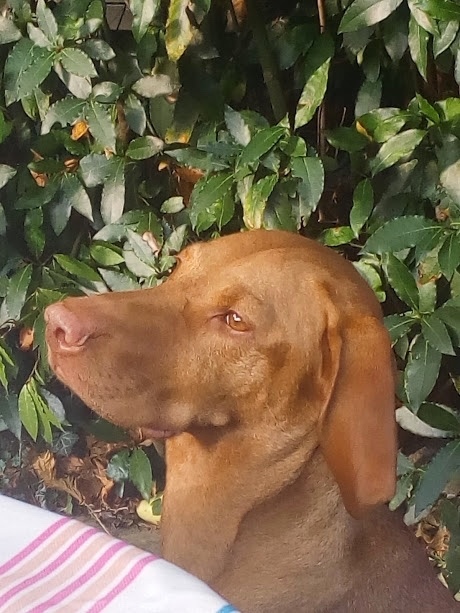 Meet Boris, our friend's Hungarian Vizsla and a very experienced Canicross runner who is about to enter his first half marathon! We love Boris! In these photos you can see Boris and his buddy in their harnesses - these harnesses allow for a more efficient run and are very comfortable for both the dogs, and the runners who have a harness around their waists. Canicross is a great sport for both humans and dogs, with big benefits for both, but above all it's just so much fun! For more information take a look at this Canicross US website. You can also search for Canicross trails in the US - check out the Wikiloc site here. If you're just choosing your dog and want a breed to run with, check out our page Running with your Dog for tips on choosing the perfect canine running buddy - there's also advice on best practices to follow!